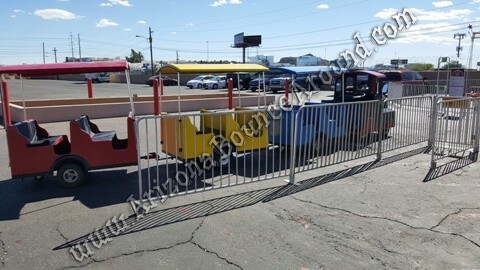 Our gas powered trackless train is a high capacity trackless train perfect for train parties or special events. Our Lego train is a beautiful gas powered trackless train complete with train whistle and a train bell, bright colors and padded seats. Our Lego train pulls 3 train cars that will hold 6 kids or 4 adults per car depending on the size of each person for a maximum capacity of 18 kids per ride. This trackless train is very powerful and can run all day on almost any flat level surface including thick grass. 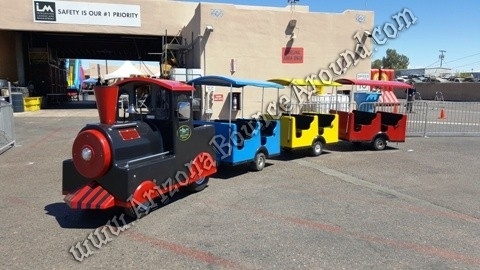 This is a gas powered trackless train and can be driven outdoors only so rent it today for your next train or holiday party. What a better way to see the Christmas lights in your neighborhood than on our Lego trackless train. 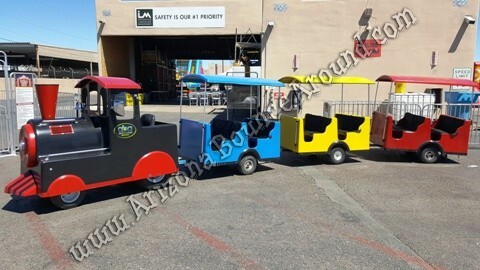 Rent a gas powered trackless train in Phoenix Arizona for parties and events from the leader in trackless trains rentals Arizona Bounce Around. We have 3 trackless trains to choose from.